This is a controller i’ve collaborated on. Graphic interface inspired by RME Version. Bidirectional communication with synthesizer for all parameters supporting CC# Midi communication. All panel’s parameters can be managed and automated in your DAW. 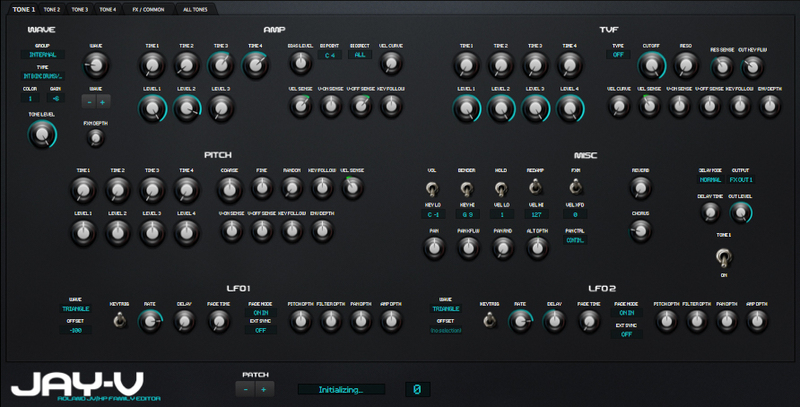 Sounds can be saved as VST or AU presets and then sent to the Moog using the “Send Panel” button. When you open your DAW’s project the snapshot is sent automatically to the edit buffer of the synth. The download is free, just follow the artist. Jay-V a HUGE panel for the Roland JV / XP family of synths which has pages for each of the four ‘tones’, an effects/common page & an ‘all tones’ page which edits the parameters of all four tones simultaneously. The panel parameters & patch names update when you change the preset via the panel so to make the best of the editor you will need bi-directional MIDI communication between your JV/XP & your computer. The panel also requires the ‘LCDdot’ font to operate, here’s a (legal) link….